Aodh, King of Scots, or Aed Áed mac Cináeda((pronounced Ay), was nicknamed Áed of the White Flowers, the Wing-footed, or Swiftfoot. He was the second son of Scotland's first King, Kenneth MacAlpin. The name is a Gaelic derivation of Hugh. He came to the throne on the death in battle of his brother, Constantine I in 877. Aodh did marry, although his wife's name is not recorded, she produced two sons. The elder eventually was to reign as Constantine II of Scotland, whilst the younger, Donald, became sub-king of Strathclyde in 908. Aodh's nephew, Eochaid, the son of his sister, whose name has gone unrecorded and Rhun, King of Strathclyde, plotted against him. His turned out to be a short reign, he died violently a year later by the hand of his cousin, Giric, in collusion with Eochaid, in contest for the throne at Strathallan, Perth and Kinross. Thus breaking the established male line of succession from Kenneth MacAlpin. "Áed mac Cináeda, king of the Picts, was killed by his associates. Aodh was buried either at Maidenstone, Aberdeenshire or in the graveyard of St. Orans Chapel, Isle of Iona. 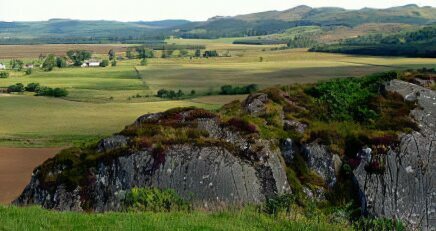 A tradition, as reported by George Chalmers in his Caledonia (1807), states that the mound of the Cunninghillock by Inverurie is the burial place of Aodh. He was succeeded by Eochaid and Giric, who ruled as joint Kings of Scotland.